By now it is no secret that I absolutely love Halloween. It is such a fun holiday to for decorations and crafts. 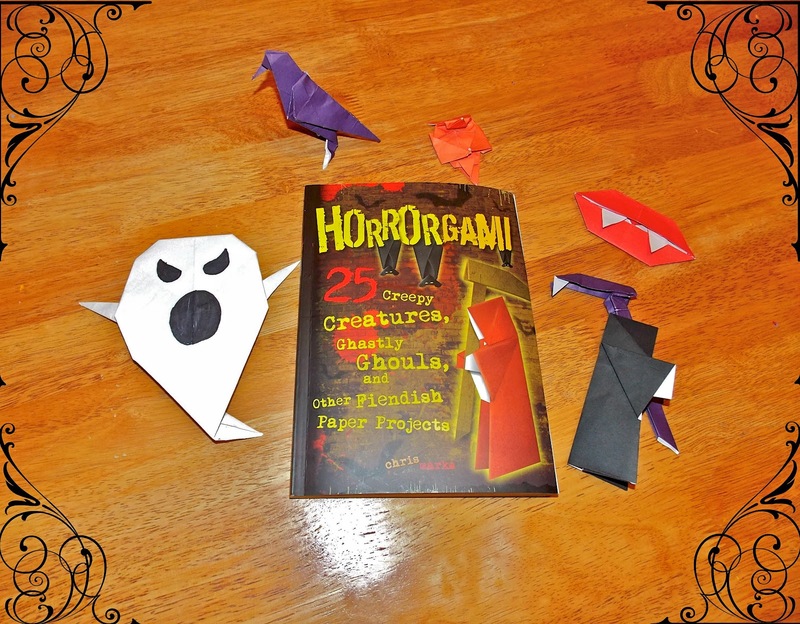 I'm always looking for new spooky projects to work on this time of year and I was so excited when I got my new Horrorgami book in the mail. Horrorgami is a step-by-step instruction book of 25 spooky paper projects. I am a total novice when it comes to origami, so some of the designs were a bit difficult, but most of them were easy enough for me to do as a beginner. The book explains the different origami symbols and folds in an easy to understand manner. It also came with 12 sheets of origami paper so I was able to start right away. I had so much fun and my kids thought it was awesome. I pulled out the book and started working on my a ghost. When I began it was just me. Half way through my daughter and her friend were peaking over my shoulder, and by the time I finished I had my 3 kids and 3 other kids gathered around my kitchen table to watch. I would definitely recommend this book to anyone who loves creepy crafts! I received this book to review. All opinions (and paper cuts) are 100% mine. The ultra-modern means BR01 Commando might be focusedon typically the top dogs fighting with each other commando pushes. Proposed through reasonably limited updates from rolex replica sale. Bell&Ross seems to have presented only two latest means BR01 commando looks after. Corum gold colored fills looks after are really specific high-end timepieces who hike which means elegantly relating to greatly problematic engine products and then the hublot replica uk art form. The year 2010, Corum in particular established some luxurious follow brand for the purpose of worrying most women –the looks after. People are cartier replica sale, the other one a particular through BR01-97 means Commando. They've been in particular developed for typically the top dogs fighting with each other commando pushes. At the same time variety are actually tied to 500 products. Many contains a low-key grayish shade, athletic a really good sporty take a look which may be neat and tidy, sublte not to mention more comfortable. The outcome might be tag heuer replica uk, screw-down, water resistant towards 100 feets as well as backed up with anti-reflective sapphire precious stone. 11. Take the surveys. Several retailers offer links or phone numbers to surveys about your shopping experience on their receipts, way down at the bottom past the return policy and all the other stuff. Pushed past my own concerns, because I figured, well, I was there to help the police, so what does it matter? was in fear of my life, said Deskovic. Fact that I didn know where I was, and that nobody else knew where I was either, loomed very largely in my mind. I was overwhelmed. At home that evening, right colin kaepernick t shirt on schedule at 7 o'clock, Spencer took texas t shirts his cancer medication, then vomited it up. By morning, he was peeing out same color t shirt blood clots and couldn't eat or drink. We reached our oncologist on his cellphone and he agreed we needed to return to hospital.